﻿ How Purchased Email Lists Destroy Your Email Marketing » Red Mango Marketing! On paper, purchased email lists sound like a good idea. Maybe you’re just getting started with email marketing, or perhaps your list of email addresses has started to go stale. You have money to spend on marketing. What you don’t seem to have is the time to grow your list on your own. In the US, CAN-SPAM legislation includes some strict regulations around the right and wrong ways to collect email addresses. Additionally, Canadian Anti-Spam Legislation, which went into effect in July 2014, requires you to obtain and document consent before sending commercial emails to Canadian consumers. Not recognizing the name of the sender is one of the biggest reasons people choose to unsubscribe from marketing emails. It’s also one of the main reasons people mark email they receive as spam. What gets people to open? According to a recent analysis of Constant Contact customer emails, businesses that send personalized emails receive higher open rates than those that send broad messages to their entire list. Just as the contacts from a purchased list won’t know about your business, you’ll know even less about them. Creating targeted messages from a purchased list is nearly impossible. In-store: Use a paper sign-up sheet or use Constant Contact’s Text-to-Join feature to allow new customers to sign-up from a mobile device. You can customize and print a paper sign-up sheet here. 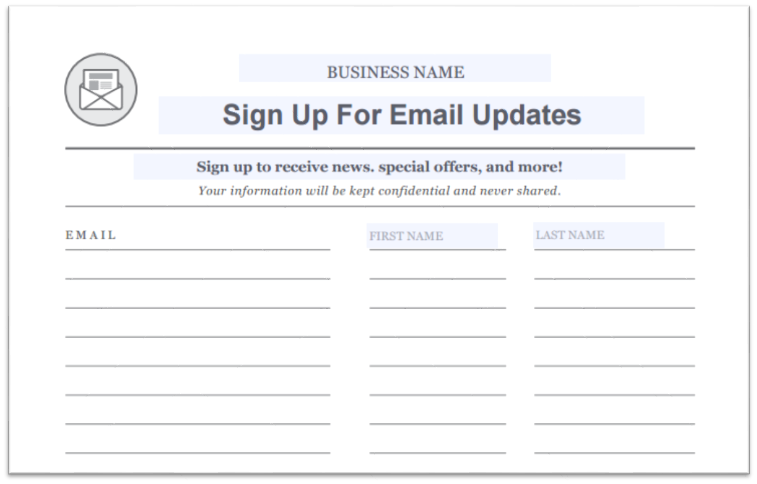 Website: Embed a sign-up form right on your website, so that new visitors can easily subscribe. If you have a WordPress site, our Constant Contact Forms plugin allows you to create a sign-up form in minutes. Social Media: Include a link to your online sign-up form in your social bios and add Constant Contact’s Join My Mailing List app to your Facebook Page. Once you start building your list, make a good impression on new subscribers. Email marketing relationships are a valuable marketing asset. In fact, 91 percent of consumers want to receive emails from the organizations they do business with. Building these relationships starts with making sure you have permission before adding someone to your email list. The post How Purchased Email Lists Destroy Your Email Marketing appeared first on Constant Contact Blogs. This entry was posted on Wednesday, May 10th, 2017 at 8:00 am	and is filed under News & Updates. You can follow any responses to this entry through the RSS 2.0 feed. Both comments and pings are currently closed.